Jade is a beautiful stone that has been used as birthstone for many thousands of years. It has been highly valued and honored in ancient China, and even to date, it holds a very high position among all the other gemstones in this culture. Today, Jade is equally revered by the Chinese, as much as a symbol of worship (e.g., statue of Goddess Quan Yin) as it is a decorative unit. For the Chinese people, Jade is considered pretty much like diamond, one of the most revered stones in America today. For the Chinese, Jade embodies Divine qualities and brings beneficial spiritual and healing energies. Another important civilization knew about Jade. It was the ancient Mayan civilization and the entire Mesoamerica. Not only did the Mayans use Jade in jewelry, but they made their tools and weapons out of Jade. One important property of this Jade recognized from early on is that Jade has a certain degree of hardness, but at the same time it can be easily carved. The source of Jade in the central regions of the American continent is still not very well known. Jade is thought to instill calm and relaxation. It is a stone of good luck, fortune, and longevity. Some sources say that the Maoris warriors from New Zealand used the nephrite variety of Jade to make weapons. Jade in close contact with the skin on the lower back is thought to help treat kidney problems. 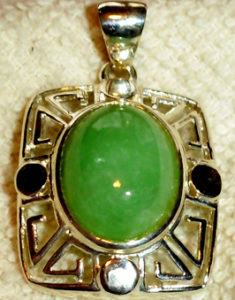 Jade is the official gemstone of Wyoming and Alaska as well as British Columbia in Canada. Jade, doesn’t belong either to the traditional or the modern birthstones chart. It is an hour of birth birthstone for 9 PM. Some people consider that Jade is a birthstone for people born in March, others associate it with the astrological sign of Virgo. That would make it a September birthstone for the most part. Either way, it may bring you good luck and fortune if you are born in March or in September. 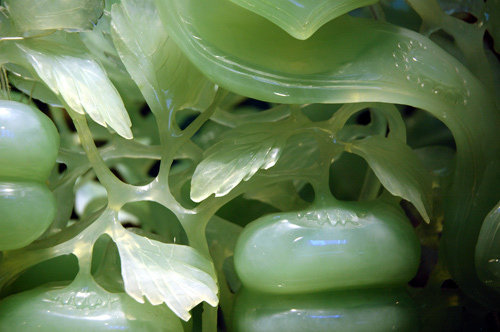 People usually don’t know that Jade comes in 2 varieties, as Jadeite and Nephrite. Even though they may look the same, they are two different minerals altogether. Sometimes, even experts have difficult times telling them apart! For example, if you take their color as the only indicator, you are likely to fail to discriminate them. The reason is simple, both varieties of Jade are colorless in their pure form and the color comes from impurities within the structure. Therefore, when you buy your precious birthstones, ask the help of a really good professional gemologist, or purchase them from reputable sources. In this post, we will try to discuss the differences between the two. Nephrite is classified as a silicate of calcium and magnesium from the actinolite and tremolite series. It is a mixture of fibers of these two minerals. Jadeite is also a silicate mineral, but unlike Nephrite it contains mostly sodium and aluminum. The type of mineral is granular in structure and originates in the pyroxene group. Jade is a traditional stone of China. The main source of Jade in ancient China is the Nephrite jade mineral. Only after 18th century Jadeite has been introduced to China from Burma. Burma (today Myanmar) remains the main source of quality jadeite to date and when you see a specimen labeled Burmese jade it is virtually equivalent for quality jadeite. Other sporadic occurrences of Jadeite are in Japan, California, Switzerland, and Guatemala. When it comes to hardness, jadeite is harder than nephrite. In general, it ranges between 6.5 and 7 on the Mohs scale. Jadeite is usually much better polished and has a glassier look, as compared to the waxy gloss of nephrite. Because of its softer nature, Nephrite is typically used for carving statues and different objects. Iron, chromium, and manganese are common impurities in both Jadeite and Nephrite, contributing to numerous varieties of Jade’s colors and hues. Nephrite, for example, is commonly found in a spectrum of colors from gray to yellow, with the most valuable green and white. Jadeite can also take on a huge variety of colors (yellow, golden, green, lavender, blue, pink, red, brown, black, white, gray, etc. ), and even transparency. It can rarely really be transparent, but it can be of valuable translucent type. It is possible for a Jadeite gemstone to have several different shades in the same specimen. Besides the degree of transparency and color, other important factors that determine the quality of Jade is the intensity of the color, and homogeneity. The more intense the color the pricier the gemstone. It goes without saying that the more transparent, the more expensive the gem. If the specimens is not homogeneous throughout the surface, it will be of lesser value. Even different color patterns can be valuable. Because of the number of parameters that should be examined before an expensive purchase, always consult with the experts. If you intend to buy Jade jewelry, be careful. Today too many varieties of fake jade are marketed as genuine jade. These minerals have nothing in common with either nephrite or jadeite. Here we give some good examples of jadeite and nephrite. 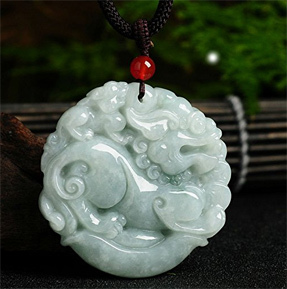 Below is a grade A Jade, a Hand Carved Jadeite in a form of Amulet Pendant. The origin of the stone is Myanmar. You are looking at a natural, undyed, and untreated first class jadeite jade. Nephrite can also be beautiful. 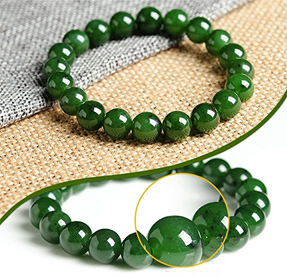 Below is a natural emerald green bracelet made of Green Nephrite. 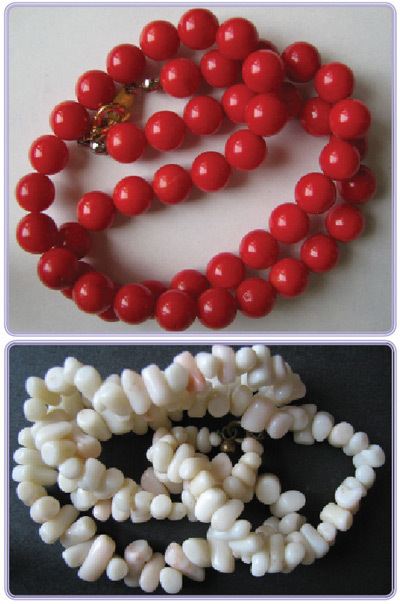 The 9 mm beads are also hand carved. If you are born in March or September, Jade could be one of your favorite birthstones. Even if you are not using it as your personal birthstone, this fantastic stone that brings good luck and fortune should certainly be a valued member of your gemstone collection.